As I mentioned in my last post, I recently attended an event at the Tenement Museum featuring Chimamanda Ngozi Adichie. She read from her new collection of stories, The Thing Around Your Neck, and then was interviewed by—more had a conversation with—Tayari Jones. Now, the one other time I attempted to see Chimamanda Ngozi Adichie read, her stunning novel Half of a Yellow Sun had just come out and there was a line stretching about a hundred miles long outside of the New School. I didn’t have a dream of getting near to her. Now, she has published her third book, been awarded a MacArthur Foundation Fellowship and been named one of the New Yorker’s 20 under 40, yet there was room to spare in the tiny Tenement Museum storefront. Inexplicable, but truly lucky! I felt so privileged to be there, thanks to the keen notice of my friend Kristen, who found out about the reading on Tayari Jones’ blog. Both women were gorgeous, warm and full of brilliance. The only time I’ve cared about the World Cup—sorry, everyone—was when Ms. Adichie spoke about how, now that she divides her time between Nigeria and the States, she identifies more with all Africans rather than only with Nigerians, and so after Nigeria got knocked out, she is free to cheer for Cote d’Ivoire. I loved hearing her talk about how she never considered herself black until coming to the States and how taken aback she was the first time a man on the street called her “sister.” Tayari Jones closed out the evening delivering an extended metaphor comparing starting lots of stories before finding your novel to dating lots of men until you find the one you want to go all the way with, which was a really special kind of amazing. This question drives me up the wall, because it is generally not asked with the intent of eliciting an answer; it is almost always an accusation. If it were an honest question, I would be happy to answer it, mostly focusing on the small, select, irreplaceable group of writers I met there who are and will continue to be not only my most valuable readers and collaborators but some of my favorite friends. Connections, confidence and some seriously awesome professors also top the list. But, I sometimes just get annoyed by the question and say something stupid, defensive, or mean. MFA programs are certainly not perfect, but they have merit and I wish I could trust myself to always convey that. So I was happy to find this blog post by Danielle Evans, which brilliantly and effectively deals with the criticisms levied at writers for attending MFA programs. This post is a follow up, and is just as good. I freaking love Danielle Evans and cannot wait until her first collection, Before You Suffocate Your Own Fool Self, comes out in September. I found out about these posts from Tayari Jones, who interviewed Chimamanda Ngozi Adichie at the Tenement Museum last Thursday. Don’t get me started on those two. 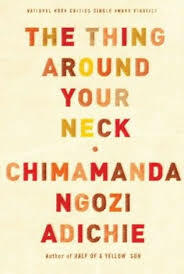 (I mean don’t get me started yet–a post is forthcoming in Ms. Adichie’s fantastic new short story collection.) Stay tuned! This entry is by guest post-er Nicki Pombier Berger, writer and founding editor of Underwater New York. Check the site for more information about activities and events surrounding the release of What He’s Poised to Do. What He’s Poised to Do, Ben Greenman’s fifth collection of short fiction, grew out of Correspondences, a limited-edition art book of stories on the subject of the title, printed postcard-sized, unfolded like letters to read. Greenman’s earlier collections also had an architectural self-awareness, but What He’s Poised to Do sheds this concern with construction. Postmarks for each chapter give a playful nod to the book’s trope, but the connections explored are those between people: how we try or hope or fail to reach one another, and how our attempts reverberate or linger. In loosening his grip on structure, Greenman loses none of his hold over the reader. Instead, these stories seem informed by the same depth of empathy that last year gave us Rock Foxx, the funk rock front man of the novel Please Step Back, whose fame is so convincing because he is so inhabited. It is Rock Foxx who does the talking, and with What He’s Poised to Do, Greenman again steps back, this time letting his characters do the writing. If you read Our Books are Better than We Are, I assume you know about Underwater New York, the online anthology of writing, art and music that I co-edit. We have a load of amazing activities and events coming up this summer, not the least of which is a reading in the Word for Word series at Bryant Park. If that sounds like a big deal to you (perhaps you are imagining years of Project Runway contestants whose lifelong ambition is getting to Bryant Park…), it is! The lineup of readers we assembled is too outrageous to be believed–I would name them all here, but that’s not really what this post is about…oh, who am I kidding: Ed Park, Deb Olin Unferth, Nelly Reifler, Said Sayrafiezadeh, the musician Michael Hearst and one more very special guest!!! But, really, I mention the reading only to segue into the fact that I am a writer, a small toiling fiction writer and book blogger, who has suddenly taken on the alter-ego of an editor who must contact writers on behalf of her publication. This development has the possibility of becoming a game-changer for this blog. If you scroll back through the archives, you will see entries about books by several UNY contributors, books I rave about like a bit of a fanatic. At the time I wrote those entries, the authors were not people I felt I existed in the same world with–they were not, say, my Facebook friends. Had they been at the time I wrote those posts, I may have tempered my sycophantic tendencies and rants about wanting to become their bestest friends. Or, maybe not. I was just being honest, right? Rivka Galchen is neither my Facebook friend nor an UNY contributor (yet) but I did write to her regarding UNY and she was lovely. At the time I contacted her, I hadn’t yet read Atmospheric Disturbances–I was reaching out to her based on the assumption I’d like the book because I once attended a panel discussion on which she was a compelling participant. But, feeling like a total impostor emailing her without being totally familiar with her work, I requested Atmospheric Disturbances from the library and it arrived at my local branch–ah, Queens Library–about three long weeks later.